This tutorial uses an LTC3406B synchronous buck integrated circuit to demonstrate the features and operation of the SIMPLIS/SIMetrix Design Verification Module. This model was developed solely from publicly available information in the LTC3406B product data sheet. Configure the LTC3406B circuit to run built-in testplans in the DVM simulation environment. Generate a Bode plot using the SIMPLIS single-run analysis. Before you start the tutorial, verify that you have SIMetrix/SIMPLIS v8.0 or later, and a DVM license. DVM is an optional license feature for SIMetrix/SIMPLIS. To learn how to evaluate DVM, go to our evaluation page. Download the archive of example files SIMPLIS_dvm_tutorial_examples.zip , which contains both the schematic and testplan examples for this tutorial. Unzip SIMPLIS_dvm_tutorial_examples.zip to a location on your local hard drive. To open the schematic, double click the LTC3406B-AC-Bode_Plot.sxsch file or drag that file into the SIMetrix/SIMPLIS Command Shell. 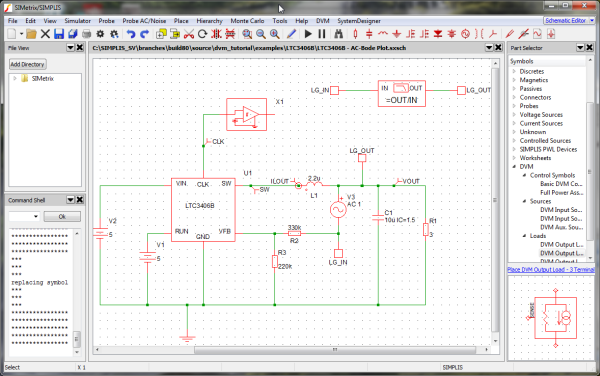 Result: The schematic should look like the image below. Note: The images in this tutorial appear as thumbnails for quick loading. To go to a full-sized view, click anywhere on the image. To close the full-sized view, click on the image again.